Banne Nawab's Chapli Kabab Masala was awarded the Superior Taste award in 2010 by the International Taste and Quality Institute. Among the more well known dishes of Pashtun cuisine, chapli kababs are beef mince patties that are quite spicy and commonly eaten with flatbread. You can easily make this dish with Banne Nawab's Chapli Kabab Masala and a few basic ingredients. 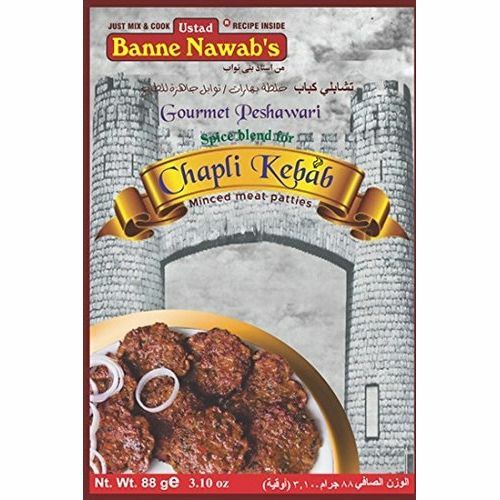 Banne Nawab's Chapli Kabab Masala is also suitable for preparing balti kababs. The sealing technology used in packaging Banne Nawab's Chapli Kabab Masala ensures that the food you prepare tastes as flavorful and is as aromatic as if you had used fresh spices and herbs. Although traditionally you barbecue chapli kababs to cook them, you can simply stir fry the patties to prepare them at home according to the instructions on the box.